When a patient comes to me with shoulder pain, I immediately try to determine if there is involvement from the rotator cuff tendons, ligaments, capsule, or labrum. These are all structures that are located in the general area of the shoulder joint and could be the culprit. Very rarely do I find that these singular shoulder structures are the primary cause of the pain. After determining the contributions from these specific structures, my evaluation broadens and this is where I start to pick up on surrounding muscles, joints and nerves that could be causing the symptoms. The neck and the thoracic spine (the part of the spine that the ribs are attached to) are often involved – much of the musculature in this area connects to the shoulder, the nerves that innervate the shoulder come from the neck, and in my opinion, the most significant joint of the shoulder girdle complex is included here – the scapulothoracic joint (where your shoulder blade and rib cage come together). Then we start traveling down from here – the latissimus dorsi is usually considered a “back muscle” because that’s where the bulk of it is located, but it’s main actions are shoulder motion. Don’t even get me started on the pectoralis major and minor – if they are tight, they pull the shoulder forward and then this causes an imbalance and the levator scapulae gets tight and tries to pull the shoulder back. The pecs might be tight due to poor posture that causes the shoulder and back to round forward, but this could be caused by tightness in the hip flexors that is causing the body to pull forward….as you can see, the connections, imbalances and compensations just go on and on – sometimes people’s shoulder pain is actually related to structures all the way down in their legs! So now you can see that if someone purely treats just the shoulder, more than likely their shoulder pain is not going to completely improve. All of the other structures need to be assessed and become part of the treatment plan as necessary. So, now you can see how many possible contributions there are to shoulder pain and dysfunction, but let’s concentrate on one that I think might be more involved than we think. 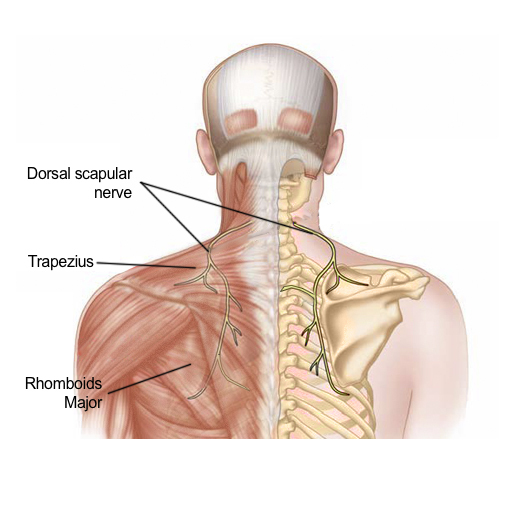 DNS – Dorsal Scapular Nerve Entrapment Syndrome might be more and more common now that many people spend a lot more time on the computer, have poor posture and are not as active (which all leads to muscle imbalance and tightness). The dorsal scapular nerve starts in the neck, then goes through and under multiple muscles in the neck, upper back and shoulder blade area. There are so many places that people could experience possible entrapment, compression or irritation of this nerve which then leads to very diffuse symptoms that can be hard for people to describe – burning between the shoulder blades, radiating pain, numbness and tingling down the back of the arm, shoulder pain, etc. There are many ways to treat this depending on the specific structures that are causing the nerve irritation, but what I have found to be the most helpful is to release the musculature that is involved with dry needling, myofascial release, cupping and soft tissue mobilization, joint mobilization of the neck, back, shoulder and shoulder blade, then exercises to re-educate the muscles to work correctly, restore posture and muscular balance and prevent the muscles from tightening up again. These treatments are very individualized as everyone presents completely differently. If you are looking for a more comprehensive treatment that is completely one-on-one and focused on you, contact Dr. Lisa Wilcox with Solstice Physical Therapy. All treatments are private and are based on your specific goals!